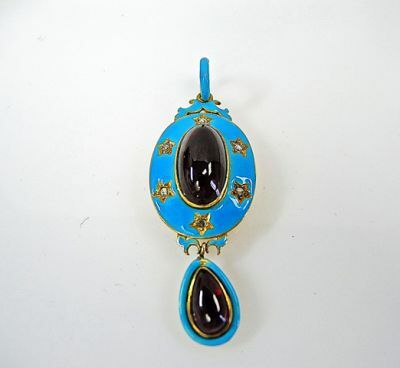 A beautiful Victorian18kt yellow gold powdery blue enamel pendant with 1 oval cabochon deep purplish red garent, est. 22.53ct. ; 1 pear cabochon deep purplish red garnet, est. 2.25ct and 6 old European cut diamonds, est. 0.25ct (clarity SI-I & H-I-J colour).